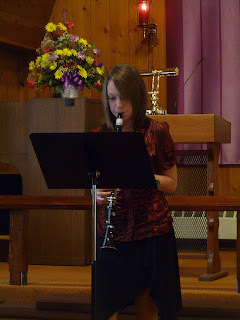 Older Daughter's music recital was last Saturday. 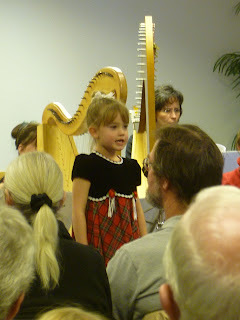 Her elderly teacher, in addition to teaching piano, also teaches harp, so the harps dominate the scene. It really is extraordinary to be in the presence of fourteen harps at once, ranging from full-scale concert pedal harps down to little Irish lap harps. 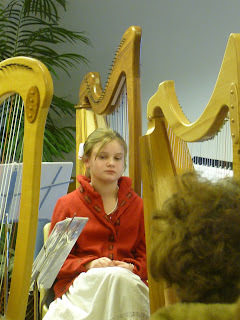 Ages for the harpists ranged from young (13) to old (88). There's just nothing prettier than a harp and its player. ...and this young lady belted out "Jolly Old St. Nicholas" in beautiful style. 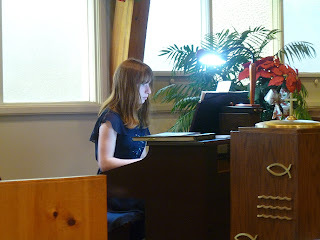 Older Daughter played two pieces (We Three Kings and Prelude in C) and played them beautifully, without one single mistake. She was relieved! The relief was short-lived, however, since the next day (Sunday) both girls played in church, along with some other children. 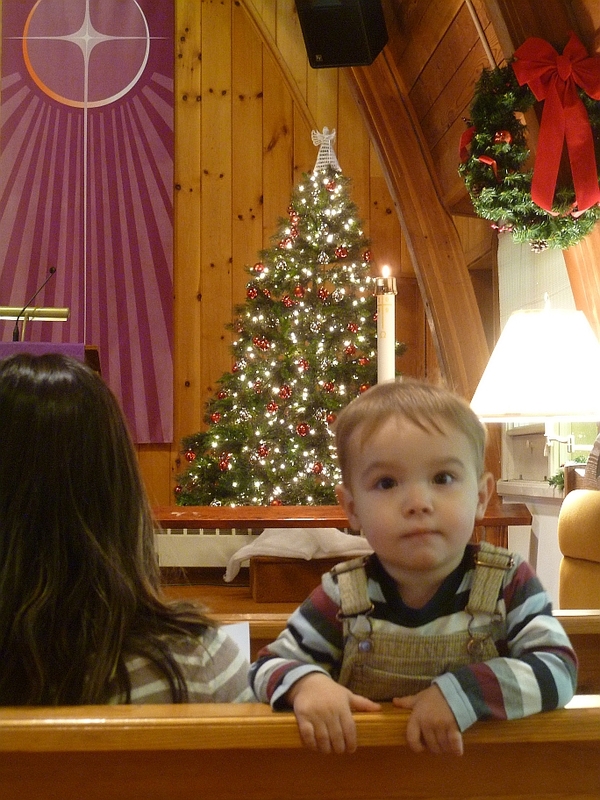 Little Reeser at first was more interested in the camera than the music. This fellow has only been playing trombone for two months, and I was astonished by how clear his tone was. That's a difficult instrument! 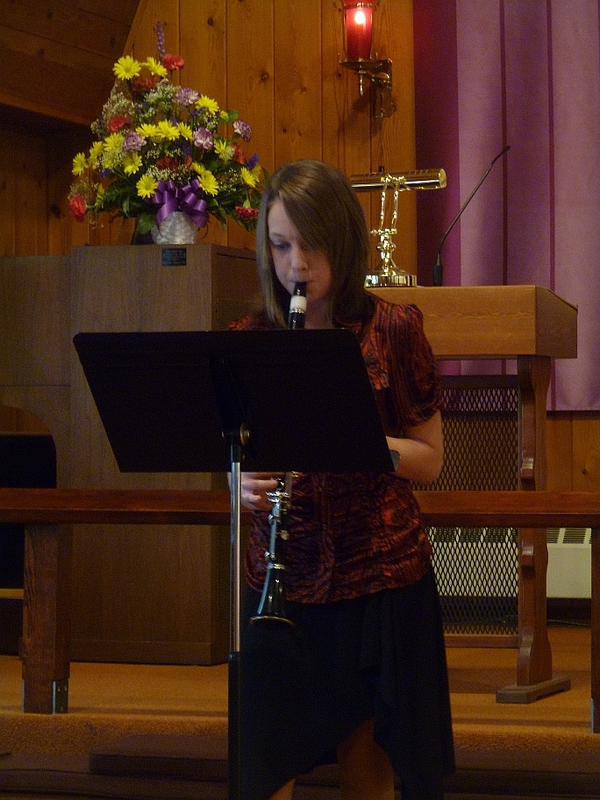 This young lady made a mark with her clarinet. 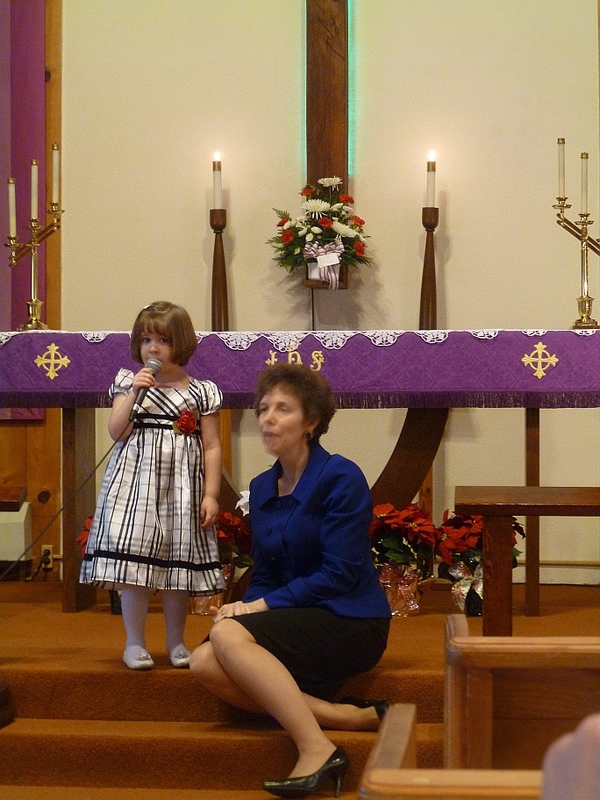 Little Haileigh (age 4) gave a rendition of Away in the Manger, along with her Sunday school teacher. The microphone was turned up too high so she nearly blasted us from our seats, which gave the congregation a good chuckle between putting our fingers in our ears. She's not shy! 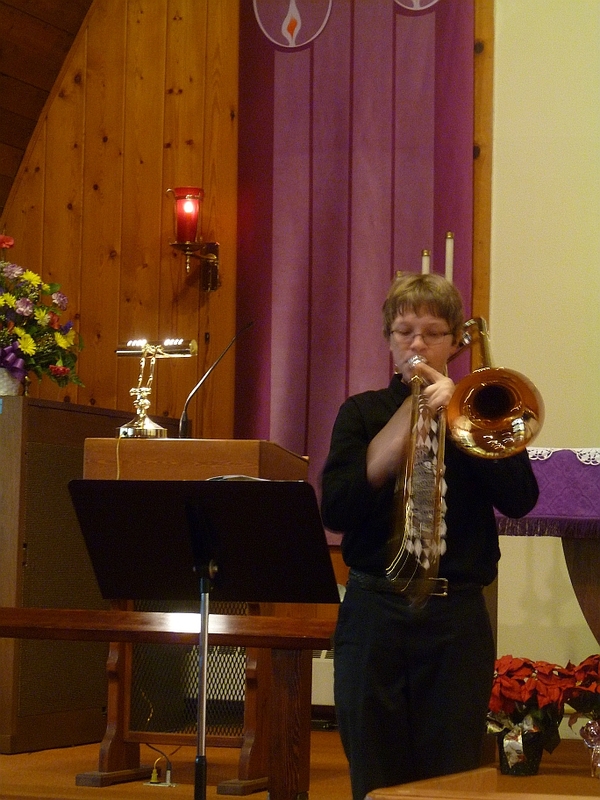 Younger Daughter played beautifully. She won't admit it, but this performance was less nerve-wracking than the last (though when she reads this she'll deny it). Older Daughter not only played a couple of pieces solo, but she also played the accompaniment to Younger Daughter's violin and the other girl's clarinet. 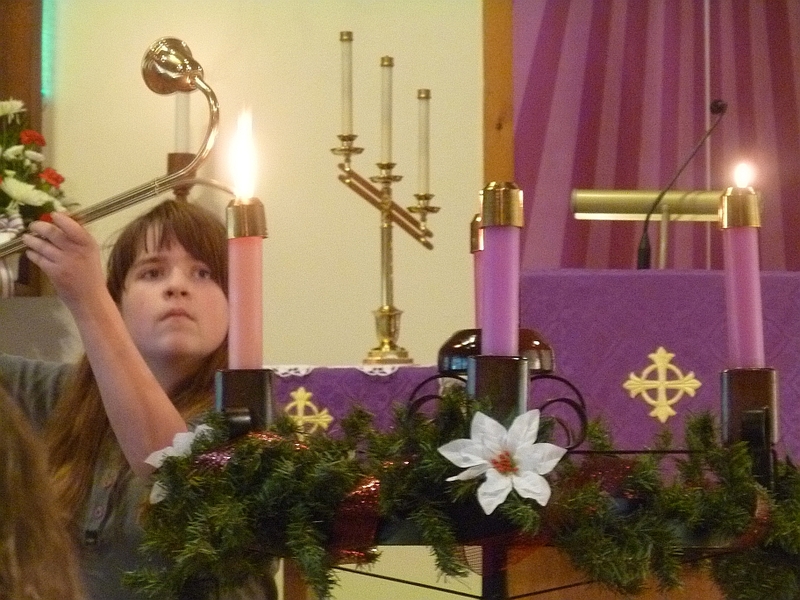 Younger Daughter lights the advent candles. 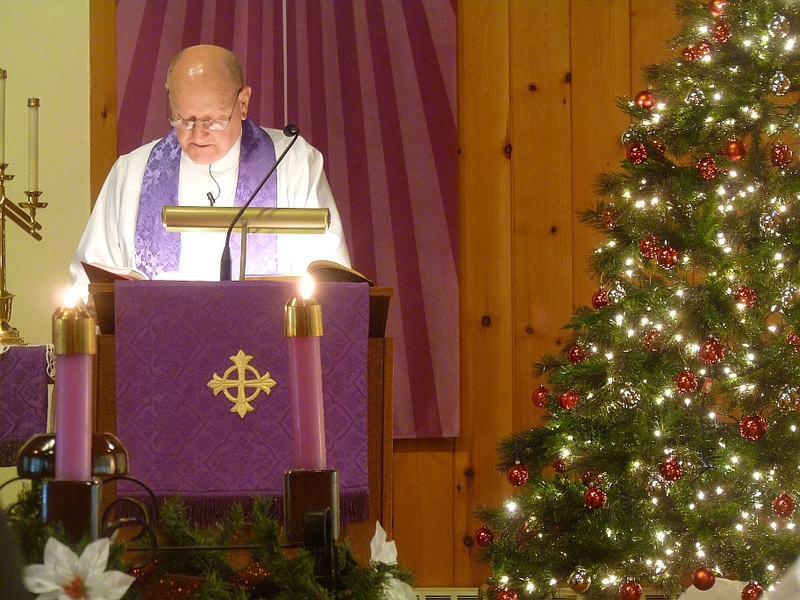 Our pastor reads the Gospel text upon which the sermon was based. Altogether it was a beautiful service, though I think the girls are relieved it's over! The very thought of hearing all those harps being played at once gives me sure enough goosebumps. Older daughter's posture is positively elegant. Younger daughter gets prettier with every new photo. What a wonderful Christmas celebration! 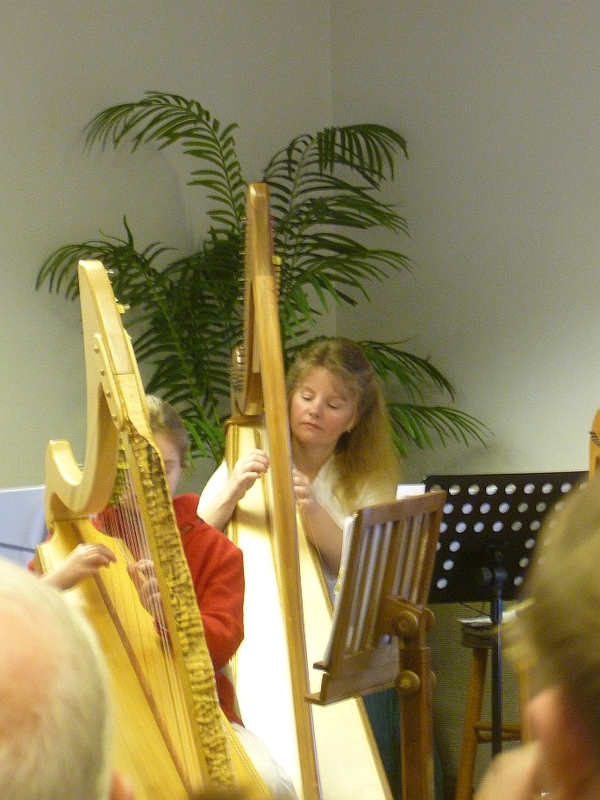 Harps - such lovely instruments. 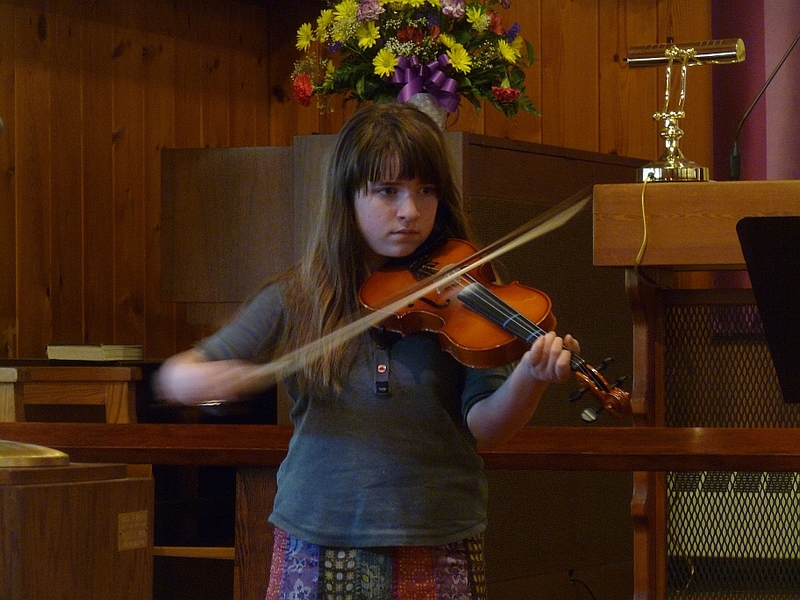 Your daughters are not only learning to play musical instruments, but they are also learning something else that will serve them well throughout their lives. That is the ability to remain poised and confident when addressing a group. They may feel uncomfortable about their public performances now, but in time they will come to appreciate these experiences, building up self-confidence without creating a sense of arrogance. Good work, girls...and good thinking, mom & dad. I wish every child could have the upbringing your girls, and their friends are having, and in such beautiful surroundings. You are giving them things that can never be taken away from them: music, the ability to speak their own language clearly, good character and values... It looks like a Kid Paradise to me. 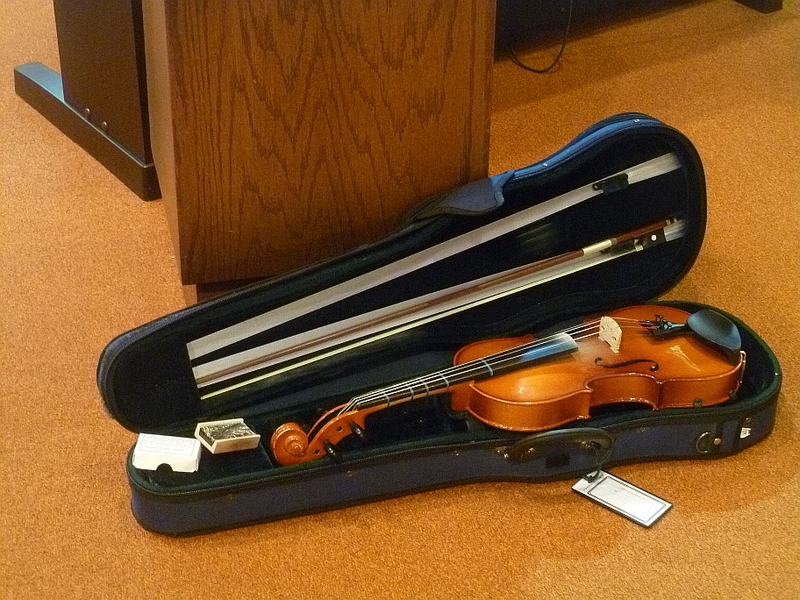 That fiddle in the case shot rocks!